APE, the creation of high performance machinist Jay Eshbach, is a study in survival and adaptation in the high performance motorcycle business in an ever changing world. Jay has not only managed to supply motorcycle racers with go-fast parts since the early 1970’s but keep his doors open and turn a profit. That says a lot when so many doors are closing and the times, they continue to change. 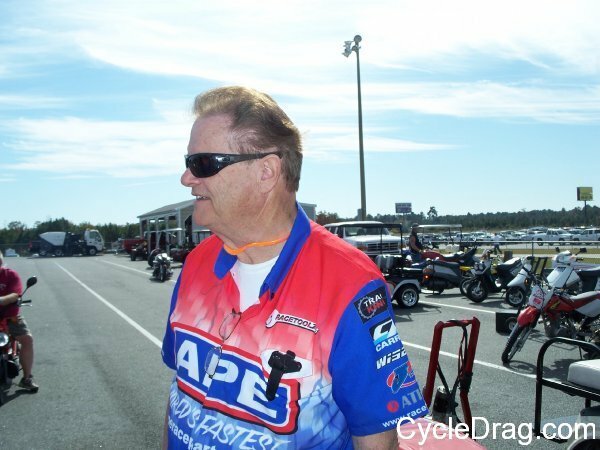 Jay started APE based on the needs of his fellow racing buddies when they started hot-rodding 750 Honda motorcycles in the early 1970’s. One of his friends told him that he had been told some big pistons from a Honda Twin could be fitted to a 750 to yield a bigger displacement, could he do the machining, and Jay replied “Sure, I can do that” and the famous 836cc kit was born. So was APE from that basic exchange of ideas and the needs of racers. What followed was the metamorphosis of innovation, supply and demand, the very bedrock of every good business. Jay’s hot-rod kit for the Honda 750 had all other kids attention and soon he was busy cranking out performance kits, then expanded to other makes and models. He contacted Bob Anderson and Tom Kipp the former owners of Wiseco Pistons to make four stroke big-bore kits. A deal was struck that APE would help them develop four stroke big bore kits, and APE became the very first Wiseco distributor for Wiseco big-bore kits. As the power levels began to soar, Jay developed heavy duty cylinder studs and his biggest customer at the time was a guy working out of his garage in southern California that was somewhat local to Jay, an innovative guy named Russ Collins. Around 1974 as this unfolded is about the time Jay’s beloved wife Dianne, coined the name American Performance Engineering as Jay’s budding business was really starting to take off. 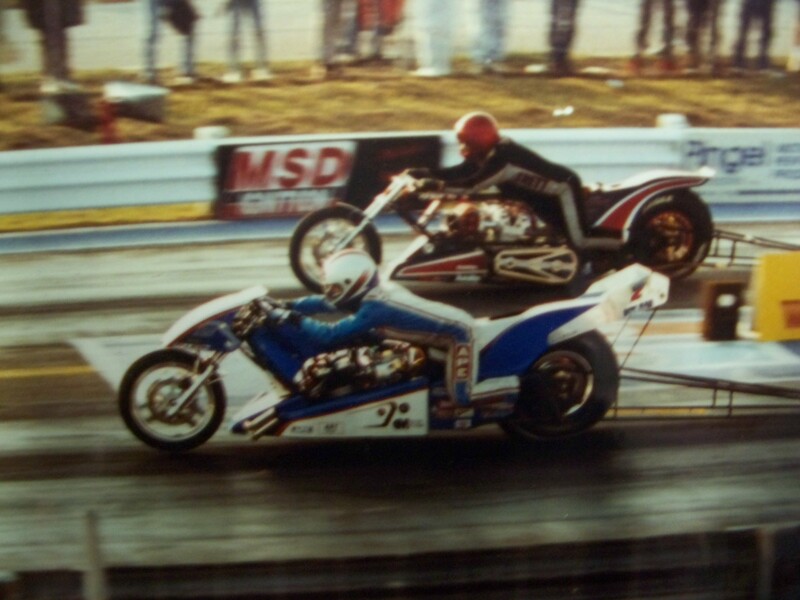 In the golden era of organized motorcycle drag racing in the early to mid 1970’s, the AMDRA, then IDBA, DRAGBIKE! and the NMRA were all formed. There was an active vibrant motorcycle drag racing boom from coast to coast. And APE was at the forefront. Billet adjustable cam-chain tensioners, adjustable cam sprockets, heavy duty stud kits, were found in almost every drag bike in America. A pivotal component that would bring a lot of business and history to APE was their creation of tool steel wrist pins. While the automotive trade had been using and creating them for many years, the quality and source of the steel was not always what it could or should be at that time and some racers were having catastrophic failures due to wrist pin breakage. Jay cured that. s strongest wrist pins that today are still run in the worlds fastest, most powerful drag bike engines. 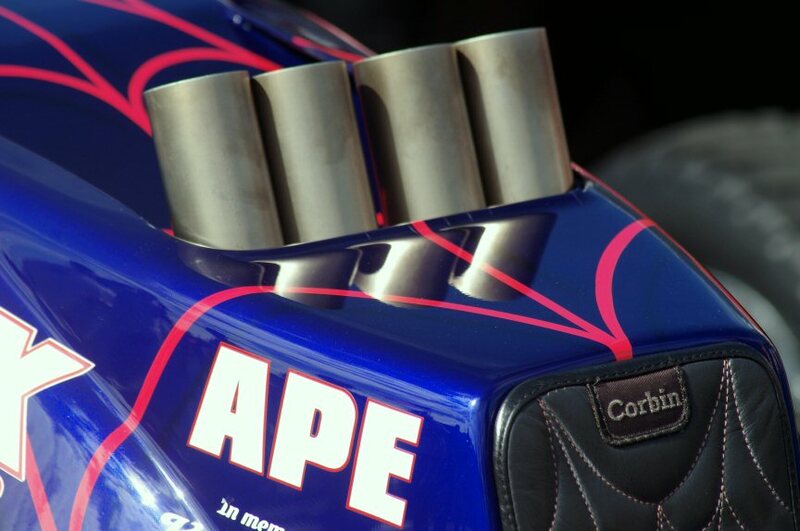 Because of the reliability and quality of APE components, his parts found their way into ¾ Midget racing cars, Road Racing motorcycles, water-craft, and quads. 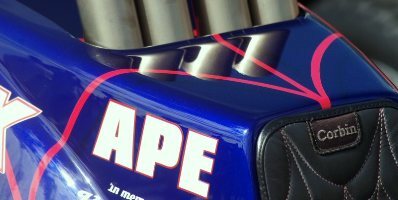 Today, all forms of motorcycle powered race cars use APE high performance products. Jay and Dianne are rightfully proud of their business and the products they sell, but if you ask them what they treasure most of what they’ve accomplished over the years, you’ll find it’s the friends, extended family and the memories they’ve acquired along the way. One such relationship stands out with pride among the many. It started at a race in southern California in the late 1970’s around 1979. Elmer Trett was on the left coast racing his double engine nitro Harley at the time and Jay saw the quality in Elmer’s double, the way Elmer machined his parts and they became fast friends at that race. What followed was a genuine friendship that lasted from that day forward until Elmer untimely death on September 1st, 1996. They were best friends. Frequently, whenever Elmer was in Cali, or if Jay and Dianne were in the Atlanta area for a race, Elmer and family would stay at Jay’s or Jay and Dianne, would stay at the Trett residence in Demorest, Georgia. Their families shared Thanksgiving diner together on more than one occasion. So close were the Trett’s with the Eshbach family, that Jay was a pallbearer for Elmer and was tasked to deliver Elmer’s eulogy, which he did so with a very heavy heart. With four decades in the business of supporting high performance motorcycles, Jay’s creation of APE now supports and delivers quality components for much of the broad spectrum of the Power Sports industry. While other companies are struggling to stay afloat, APE continues to drive ahead. Reliability, quality and experience are the reasons why. Need quality high performance parts that you can count on? 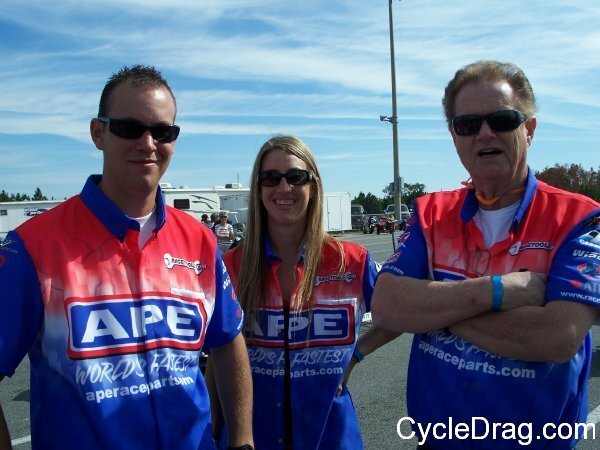 Contact Jay or his staff at http://www.aperaceparts.com/. Awesome company, fabulous products and great people! Hello Guys.. “American Express” gave me tons of trouble – Hanging up on me 15 times & blurring a: $2,200 Money Order; but I beat them / My reimbursement for this Money order should be arriving soon -and this cylinder head porting will finally take place, along with the purchase of my k435 Cams, and definitely 3 future drilled discs for my 1200cc Kawasaki. Very Sorry for this ridiculous delay… but all things worked out for the best / and I will be commuting from: Lake Los Angeles to Rosamond; really soon! “Ben”, Guess what? My church – the: “Methodist Church of Lancaster” is having a bowling league. Who knows if you also want to come out and have some fun – rolling those strikes again? Either way, I will be seeing you as soon as my check arrives in the mail; then the Ported cylinder head will happen, and I can bring in these discs one by one – to get drilled out… Future 1200cc “Turbo Cams” and “Turbo Pistons” are very likely also! My wife: “Cindy” had a Heart attack, so there have been several serious things / that have made additional delays; Sorry for this, but my hands have been tied! I recently got my 1015 barrels re-sleeved out to: 1200cc… I need to know how much that: the 1200cc “Turbo Pistons” are, and: “Turbo Cams” cost / because it will not be too long until these parts; and a: “Mr. Turbo” system goes onto my bike! Will I have to get these barrels Honed, and buy some new gaskets, when I switch the street compression pistons for the Turbo Ones – is this an easy task to do everything… without having to re-sleeve another pair of 1015 barrels and have a spare set of everything; when the Turbo system gets hooked all up? I think that I will need to get a much better: Steering Dampner, rake the frame, and some: “Performance Machine” Aluminum Rims; as well. Your Web Sites take me forever, and sometimes I can’t find what I need… I wish that you still had your good: cataloges available! Will any of you be at the Pomona Bike Drag Finals, on: November 15th? If so, great / I’ll see you at the race track, and your shop first – as soon as my: “American Express” refund Money Order for: $2,200 arrives; to get that Ported head done and purchase my 435 Webb Cams added on also; Finally!!! 3 Drilled Discs, will be brought in very soon; then some Dunlop tires and all new disc brakes will be all that I need to get going again. Thanks for all of your: Great quality parts!! !